From Corona Heights Park to the U.S.N.S. GENERAL JOHN POPE. Round three of my ongoing double P-2 pursuit found me back in San Francisco for the undocking and final departure of the U.S.N.S. GENERAL JOHN POPE to a Brownsville, Texas scrap yard. 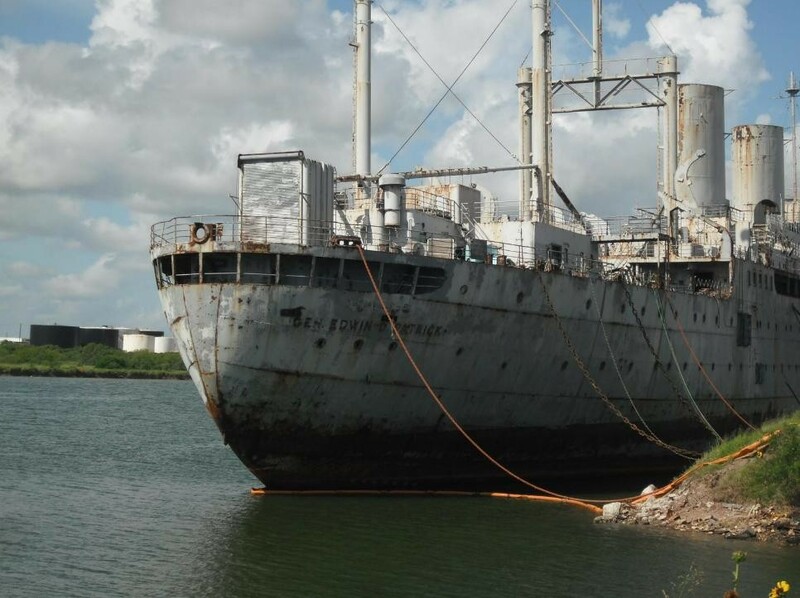 The 1943-built P2-S2-R2 type vessel had been transferred after 40 years in layup at Suisuin Bay (see prior post) to BAE Systems San Francisco, one of the West Coast’s leading shipyards, for dry docking to clean her keel and hull of lead-based paints and to insure no other substances were leaking from her hull. The POPE is one of some thirty five outmoded Suisuin-based vessels slated for disposal by the U.S. Maritime Administration. She is the very first of two classes of twenty one transports commissioned for World War Two troop and repatriation service and the very last to survive. She follows the last four VICTORYs, the last T2 tanker SANTA YNEZ and the last P-2-SE2-R1 troop ship U.S.N.S. GENERAL EDWIN D. PATRICK, which departed San Francisco for Brownsville on May 3, 2010. All photos by and copyright Peter Knego 2010 unless otherwise noted. Please click on image to see a larger version. High and dry from the flies. Bay water breaches the surface. By the time I reached the far end of the flies off her starboard side, sea water had begun to trickle in. The green water inches closer. Over the course of the next ninety or so minutes, the POPE would return to her element once and for all. 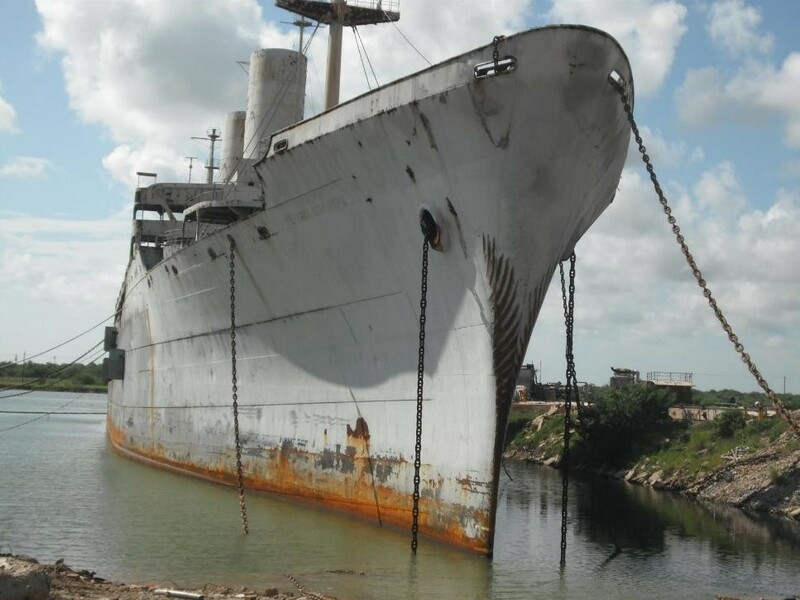 Unusual and rarely seen features such as the hook underneath her forepeak, her keel fins, blade-like rudder and twin bronze screws would gradually disappear in a torrent of brackish green sea water. Three out of four blades still dry. Welded seams and no portholes. Sleek, clean lines that were far ahead of their time. I crossed back and forth to capture the ship’s re-immersion as the massive dock gently rattled lower and lower. A small crew was on board the ship making sure the process went without hitch while a massive crane began to hoist the gangway off the fly. Partially submerged for inspections to begin. Degrees of gray defined by shadows and rust. The process stopped for approximately two hours as inspectors checked for leaks in the ship’s keel. At that point, I climbed down from the flies and took a few final shots from yard level. At approximately 11:00, I returned to the park across from the shipyard to watch as the POPE was moved to a berth to await the overseas tow. The weather had gradually deteriorated from merely gloomy to gusty and wet. As the ship slowly slipped out of the now fully submerged dock, a small group of people had gathered. One gentleman, Don Oclassen, had come to watch the ship that brought him to the U.S. from Manila in June of 1945 when he was seven years old. The POPE is edged forward by an Oscar Niemeth tug. Totally random "Blur your eyes..." shot. It was so easy to imagine the POPE in the form of her near cousin, the PRESIDENT ROOSEVELT, the rebuilt version of the identical, 1944-built GENERAL W.P. RICHARDSON. Backing in for a pit stop. The ship’s deep draft, the strong currents and gusty wind must have provided a few logistical challenges. After nearly two hours, the maneuvering was complete. The POPE was eventually secured to a temporary berth to spend one final night in San Francisco Bay. Bob Oclassen, Jeanette Woods and the Red Cross news bulletin detailing their journey to America on board the U.S.N.S. GENERAL JOHN POPE. Hand and forearm of Barton Selby. At 10:00 AM, the long distance tug was already attached to the POPE’s anchor chains. Two other tugs hovered as a third approached from the Westar Towing berth at nearby Pier 50. Don Oclassen returned with his sister Jeanette Woods, to say a final goodbye to the ship that had such a profound impact on their lives. Jeanette brought a Red Cross newsletter with photos of her and Frank, their two siblings, grandmother and mother on board the POPE. Instead of my usual gushing about the ship’s magnificent lines, I will let portions of a wonderful letter from Jeanette serve as the narrative for parting images of the POPE as she was towed away from San Francisco. Land lines are released as the tow is positioned. “On Tuesday, May 18th, Don and I plan to be in the vicinity of Pier 70 to say goodbye and shoot video & pictures of ‘our’ ship. We, definitely, have nostalgic, warm feelings toward the USS General John Pope.” — Jeanette Woods. Free and clear of the basin, the U.S.N.S. GENERAL JOHN POPE is nosed into San Francisco Bay. “My siblings and I have, with great interest through the years, kept track of the whereabouts of this ship. Our father, Frank Joseph Oclassen was an American citizen born in Manila, P.I. Before WWII he was an executive with Philippine Long Distance Company and also a member of the Board of Directors of RCA. During the latter part of the war, he was ‘invited’ to join the guerilla forces under Captain Miller of the US Army and we did not see him again until the US Military liberated us.” — Jeanette Woods. As seen from our next vantage, the end of Pier 32, the POPE approaches. Photo and copyright Rob Di Stefano 2010. 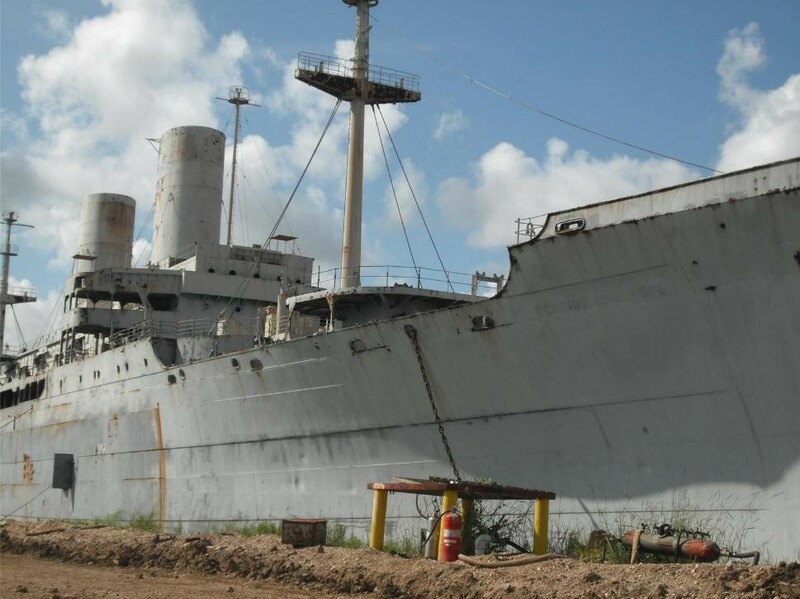 “On August 1, 1945, my Mom, Grandmother, my 3 siblings and I, a 12 year old, (Dad came a few months later) boarded (along with many troops) the USS General John Pope bound for San Francisco. I have vivid memories of the bunks in the sleeping quarters.” — Jeanette Woods. Liner-like lines in their full glory. “A favorite pasttime was watching the porpoises from the deck. The troops taught us a number of war time songs. We all celebrated VJ day, as well as my brother Don’s 7th birthday on August 14, 1945. The cook even baked him a birthday cake!” — Jeanette Woods. “On August 17th we docked in Seattle (I was told there was too much celebration in SF), the Red Cross met us at the gang plank, provided us with lodging, food and new clothing and a few days later we boarded a train to SF. I have the original Red Cross newsletter that included an article and photos of our arrival including one showing us walking down the gangplank.” — Jeanette Woods. The POPE approaches the Golden Gate after rounding Alcatraz on her outbound journey. Photo and copyright Rob Di Stefano 2010. Entering the Golden Gate on a postcard perfect day. The span's shadow is cleared. As the POPE was towed around Alcatraz and into the outbound sea lanes, the morning gloom melted away. From the promontory near the Golden Gate, in a soundtrack of gently breaking surf, traffic on the bridge and chirping birds, the last P2 made her approach. From Land's End -- passing Point Bonita Light under a garland of fog. In the open Pacific, ready to embark on a southbound course. Just as with the PATRICK’s departure two weeks prior, there was just enough time to get to Land’s End for final views of the ship as she entered the Pacific. Very Special thanks: BAE Systems, Bob Brown, Frank Cleope, Martin Cox, Dennis Deisinger, Mary Ferlin, Don Oclassen, Rob Di Stefano, Erhard Koehler, Oscar Niemeth Towing, Steve Perry, Randy Sautner, San Francisco Bay Pilots Association, Doug Satterblom, Bart Selby, Jeff Siragusa, U.S. Coast Guard, Barbara Voulgaris, Westar Marine, Jeanette Woods. I enjoyed all 3 parts very much…..great work and I do hope you can do much more of this type of work. I had hoped you would stay on board all the way to Brownsville, or was that not an option? Do you know how many crew were on board for the final journey? Quick Question; do you know of any ( “hard type”, not paper) Norway items for sale? I see almost nothing on the maritime matters website. I sailed on her quite a few times with many good memories. Beautiful pictures! Thanks for this historical, last look at these magnificent old ships. Dear Peter….I had so hoped she would still be at BAE when we got to San Francisco next weekend. I’m very glad you were able to follow her out through the golden gate, and thanks so much for recording the ends of these historical ships. Is there any chance that you will be heading to Brownsville? Next weekend if you go down to the basin across from Pier 70/BAE, you should see a very cool 1950s vintage tanker in the drydock. 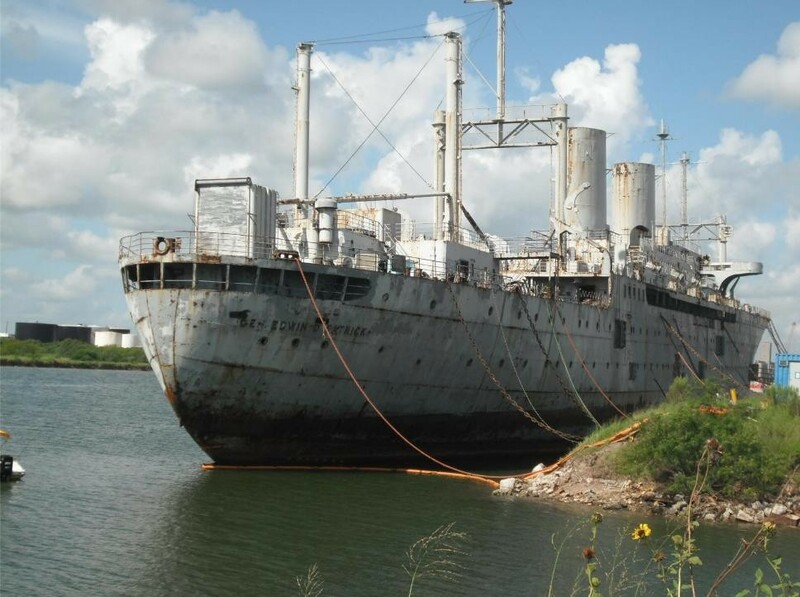 The USNS GETTYSBURG was moved today, I believe and will still be getting “cleaned”. Lovely vintage features similar to the great liners of the time, albeit with a tanker’s hull. Hate to miss her, so if you do get a chance, hope you can take some photos. Fred, thanks for your kind words. I can’t help but do this stuff but must admit I am running out of classic ships to document. No way anyone could ride the POPE to Brownsville. That would take a month or so and not necessarily in comfortable conditions. I am happy I had the time I was allowed to document her. David, thanks again for your messages. Glad you’ve liked the posts. Peter, your beautiful photos and poetic descriptions throughout all three parts of the Passage of the U.S.N.S. General John Pope were a pleasure to view and read. The ship just entering the Golden Gate Bridge is my favorite. Were it not for your interest and love, the story of these historical ships would not be told in such a captivating manner. I sailed as an Army Lieutenant on the Pope from San Diego first to Okinawa, then DaNang and finally left the ship at Vung Tau, South Vietnam in July 1967. At the time I was commanding officer of the 32nd Psychological Operations Detachment (consisting of three men, including me) traveling from Fort Bragg, NC. We have about 3,000 troops on board in Marine and Air Force units as I recall, all of us bound for service in Vietnam. I have often wondered where she was and whether she still existed. As I recall the trip took 22 days. The Pope shuffled back and forth after that trip (and before my trip as well perhaps) at least once or twice more dropping more troops at least once at Cam Ranh Bay. Great articles. Thanks for posting. Thank you so very much what a cool tribute. Excellent pictures. Peter I am very glad you got aboard. fair play and talk to you soon. After departing San Francisco on May 18th, the EILEEN MCALLISTER with the U.S.N.S. GENERAL JOHN POPE in tow arrived at the Panama Canal today a passage of 24 days. Great links, many thanks! Glad Mike from ESCO was kind enough to send these. What a comedy of errors it has been between MARAD contacts, shipyard issues and the like. A shame if I cannot go and at least document PATRICK on board in her final configuration before she disappears but glad you have been keeping the story alive to the very end. Peter, I have spoken with Mike Furgatch in reference to getting you a visit to these ships. He referred me to Chris Woods at ext 250 @ 956-831-8300 and they will review a request to see what they can do. Please call them today. P.S. He did mention that the WINTHROP VICTORY and RIDER VICTORY are now gone from us, completely dismantled. I thought I was the only crazy person out there that loved the lines of the mighty P2! I am sad that the big girls are headed to the torches…. but I am building a 1/144th scale RC model of the Pope to keep her alive in memory. Your photos helped me figure out some of the bridge wing details and forecastle. It’s such ashame that the Pope and the Patrick couldn’t be preserved in the manner as the USS Missouri and the USS New Jersey. 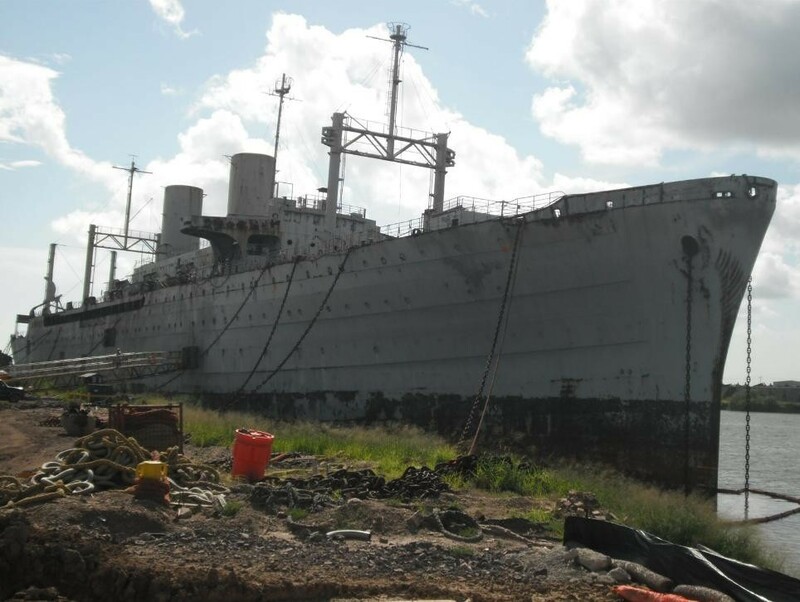 It might have been nice to have seen two genuine WWII Troop Transport Ships as museums. I shipped out of Puget Sound, Tacoma Washington on 12 June, 1966 headed to South Vietnam. We stopped at Vietnam. What a great trip, sorry that the old ship is gone, I have a lot of great memories surrounding my first “Cruise” I still have my certificate for crossing the 180 Meridian and am a proud member of the Order of “The Golden Dragon”. Thanks so much for your excellent photos and wonderful stories about this great Troop Carrier. I also have some of the newspapers produced on board when it was carring troops home from Europe after WWII ended. I was also one of many passengers that experienced an ocean voyage on this ship. I was part of the Army’s 9th Infantry Division that sailed from Oakland to Vietnam early 1967. We left Oakland on Jan. 10 and arrived in Vung Tau harbor on Jan. 29 after a stop in Okinawa. The picture of the ship under the Golden Gate Bridge is great and brings back vivid memories of viewing the underside of the bridge from the deck of the ship. The pictures of the bunk area, head and mess hall also bring back memories, but with a different feeling. Thank you for taking the time to document the part of the Pope’s final journey. I am a former member of Charlie Company 4th/47th, 9th Infantry Division and like Dave Persson (above) I too traveled from Oakland, California under the Golden Gate and on to Vung Tau, South Vietnam in January 1967. Many of our soldiers on that trip were ultimately wounded and many gave the ulimate sacrifice fighting for freedom and we will never forget them. On one day alone, June 19, 1967, we lost 47 brave troopers. May God Bless them. WOW!! !, I can’t believe I am reading this article on my favorite ship, the John Pope 45 years later, I was a specialist 3rd platoon 4/47 Infantry 9th Infantry Division, just like Bill Reynolds and David Persson I also sailed out that date to Vietnam, Bill was 2nd Platoon, I remember slidding back and forth while useing the head in the bow of the ship as it rised and dipped in the ocean but I most remember it because because another trooper and friend of mine “Rollie Gangler” came up to me in the bunk area and said to me “Bradfield” you are going to have to come back home from Vietnam, You have just became a father, my son Barnard Bradfield was born january 8, 1967 and at 45 years of age lives in Houston Tx with his family, yes I did come home from “Nam” a year later a lot of us on the ship that day did not, I will never forget them or the John Pope. As a ship buff and maritime historian I had long admired the P2’s as among my favorite ships. It is one thing to know the statistics and details of these vessels and their careers. But it is quite another to have these first hand accounts from the men who sailed them to faraway lands, like the Vietnam veterans who have left their comments here. Thank you gentlemen for making history come alive with your memories. I too am glad you came back, and thank you for your service to our country and for sharing your stories with us. Thanks so much for this article. My father (Efren Edwards Sr) was also on the August 17 1945 trip from Manila to Seattle and was about 9 at the time. He still has cystal-clear memories of the voyage, the band playing to greet the soldiers, staying at the hotel near Pioneers Square, and the nuns taking them clothes shopping on arrival. I stumbled on this article when helping my son do a school project on his great-grandfather (Thomas Edwards). I wish we had known about the last voyage of the General John Pope – my father would surely have wanted to have been there. My email address is efrened@comcast.net if anyone from the voyage wants to contact my father. — Thanks again for this great series of articles. Sailing on container vessel I met her on her last voyage in Panama Canal, 2 pictures you can find on shutterstock. If anyone is interested I will share, free of charge of course. My father is trying to find records of his voyage aboard the John Pope in 1952 to Yokahama. Would any one know if the ship’s logs are available for viewing somewhere? Thanks in advance. Left DaNang on 1 August 1967 bound for San Diego. Stopped in Okinawa and picked up about 500 other Marines that were rotating home. The Pope allowed me to “recivilize” as the journey took 20 days. Hot water, hot chow and quiet were wonderful. She brought me home!